Nancy died peacefully at Victoria General Hospital after a brief illness on Sept. 14, 2018. She will be greatly missed by her children, Chris (Janey), Kevin (Cherie), Jennifer, Valerie (Andrew), her beloved grandchildren, Neil and Cara and by her many friends and relatives. Nancy grew up and went to school in Toronto and spent many happy summers at the family cottage at McGregor Bay. At the University of Toronto, she earned a BA in physiology and biochemistry in 1953, followed by a MSc .in Biochemistry in 1955. After graduation, she married Dr. Beverly Oke, an astrophysicist, who, in 1958, took a faculty position at California Institute of Technology in Pasadena, CA. Their home, affectionately called The Oke Hotel, was open to scientists from around the world, to their many friends, and even to the friends of their children. 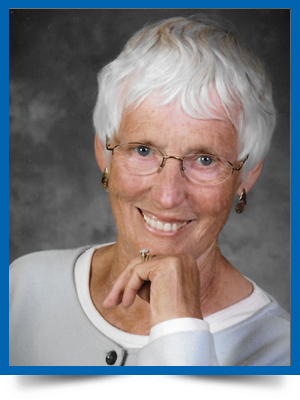 As a teacher, Nancy touched the lives of hundreds of children at both the elementary and junior high school levels. During her years at Chandler School in Pasadena, she developed an innovative K-5 science program. Nancy retired from teaching in 1991 when Bev retired from Caltech. They returned to Canada then, settling in Victoria, BC. Ever the teacher, though, Nancy volunteered as a docent at the Royal British Columbia Museum where she later collaborated with Robert Griffin on the RCBM publication “Feeding the Family: 100 Years of Food and Drink in Victoria.” At the time of her death, she was working on a book about early hotels in Victoria with Dr. Lorne Hammond, a Curator at the Museum. In addition to her work with the RBCM, Nancy had many interests. She was a regular supporter of the Victoria Symphony, audited courses on a variety of subjects at the University of Victoria, and attended ballet performances, movies and plays regularly. She read widely, did needlework, knit, quilted and was an avid gardener and adventurous cook. Travel was a passion, too, whether to foreign shores or to visit family and friends throughout Canada and the U.S. Before Bev’s death in 2004, they travelled together to such exotic locations as Mainland China and Tonga. There was never a dull moment when one was in Nancy’s company. In addition to being a great conversationalist, she had a wicked sense of humour. Her passion for playing board games – “Mahjong, anyone?” –her stoicism, her inspiration, her encouragement: there are so many facets of her personality that we will miss. Her perpetual cheerfulness and zest for life endeared Nancy to all who knew her. Indeed, she had the ability to make people she hardly knew feel as if they had known her forever. There will be a celebration of her remarkable life at Somerset House, 540 Dallas Rd, Victoria, BC on October 13th between 1:00 and 4:00. Donations may be made in Nancy’s memory to the Victoria Symphony, Box Office, Suite 610, 620 View St, Victoria, BC V8W 1J6 or through CanadaHelps.org. her interests, teaching, music, native art and the list goes on. Regardless of all her difficulties she always had a smile. We will miss her. I am so sorry to hear that Nancy has left us. I enjoyed many years of assisting her at the City of Victoria Archives and then was fortunate to reconnected with her over the last few years. I will miss seeing her. Jamie and I send our deepest sympathy to Nancy’s friends and family. What a wonderful person Nancy was. I will miss her lovely presence. We met when she first took an art history course from me at UVic in 2001 and developed a friendship over ten more of my courses right up until the fall of 2017. Any course was better for having Nancy in it for her amazing intellect and thought provoking questions. Future students will benefit from what I learned from Nancy. My sincere sympathy goes to Nancy’s family and friends. I met Nancy at St. John the Divine where we got to know each other quite well. We would also meet at the Symphony and Cinecenta. I will always remember her warm personality and smile. Nancy touched my heart when she arrived at Somerset House in Victoria to find the perfect suite. Her warmth, kindness and beautiful heart will be remember by me for many years to come. Her strength of character and compassion stand out to me and I know that all who knew Nancy would agree. Condolences to Nancy’s family and friends. Rest in Peace Dear Nancy. I knew Nancy for many years. We met first of all as volunteers at the museum and found we lived close to each other in Cadboro Bay. We often met there for a short walk followed by coffee. Over the years she sometimes joined us at the Belfry theatre and Cinecenta and we might meet for lunch somewhere when she was out with the handydart. She didn’t let her recent difficulties stop her and led a full life. I was full of admiration for her; for her intellect , many interests, warm personality, smile and abiding cheerfulness. She was a wonderful person. Norman and I send our condolences to Nancy’s family and friends. Don first met Nancy in late 1955 while he was a student at the University of Toronto and Bev was a newly appointed Assistant Professor. Don particularly enjoyed an evening with Bev and Nancy in their first home, a mini apartment on Yonge Street. We met again in the late 1960’s when Bev helped Don obtain time on the Palomar Telescope and Don visited Nancy, Bev, and the four children in their home in Altadena. After we were married we enjoyed their hospitality in their Pasadena home in the early 1970’s. Our paths crossed again after Nancy and Bev had retired to Victoria and we moved there from Ottawa in 1994. Win enjoyed interesting and often hilarious lunches and outings with Nancy and Betty Hesser. As the Obituary above so wonderfully describes, she was eminently knowledgeable in many subjects, as well as having a “wicked sense of humour”! She could do so many things so well, and it was always a treat to spend time with her. We went to many Garden Open Houses, many concerts, and travelled to Vancouver and Toronto to explore many museums. Win had the privilege of accompanying her on a Garden Tour in the UK and also two trips to Banff for the Banff International String Quartet Competition. Wonderful times. Along with many others we were enriched by being with her. She will be fondly remembered and greatly missed by many people, including us! We join in sending our condolences to her family and friends. There are people in your life that leave an indelible mark. Nancy was that person for me. I felt privileged being her friend and colleague at the Chandler school. We shared the same soul for teaching 4th Graders. An afternoon with her was enriching and bonding. Together we explored the world of books, art, music, tanograms to name a few. There wouldn’t be a visit without a walk in the garden where she identified every plant. She gave me courage to pursue my doctorate. I am so heartbroken learning that Nancy has passed. I loved her deeply. I am so glad that I made it to all her homes in Victoria. I have so many memories of our time together learning about her travels, her antique putter, her books, as you can see, I do not want to let her go. Her spirit will always feed mine.